A real-time strategy game for PC and tablets with unique AI and gameplay set in the American Civil War. Designed by the creator of the popular mod series - DarthMod! 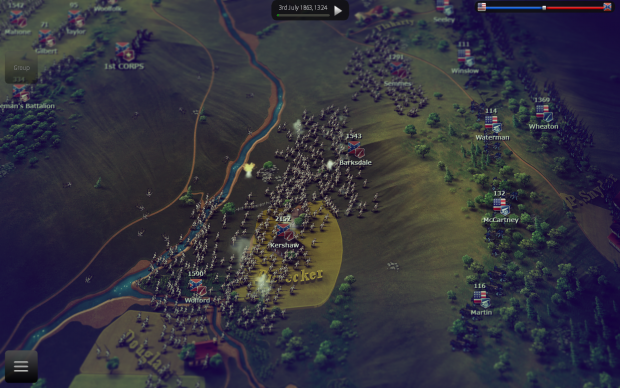 Ultimate General: Gettysburg is a tactical battle simulator that allows you to lead thousands of soldiers in the famous battle of Gettysburg as commander of either the Union or Confederate army. The game features the most accurately created map, complex morale, innovative control mechanics and smart AI. You have the freedom to use different strategies while the battle progresses. Your decisions and military performance play a crucial role in the result. Lead your army and win the Battle of Gettysburg! 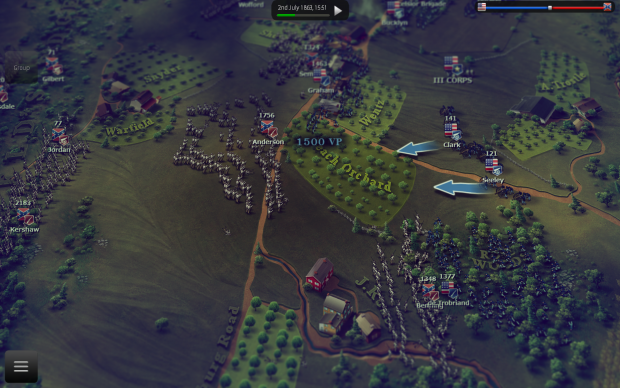 Ultimate General: Gettysburg does not use "AI gameplay cheats" because it does not need them. The game's difficulty is accomplished only by nine distinctive AI personalities, each with their own advantages and special skills. AI Commanders are able to evaluate and gain tactical superiority in real time, reacting according to their different commanding skills, aggressively or defensively, heroically or cunningly and resemble different, competent human players. Can you re-enact Pickett's Charge? What if Lee attacked the center of the Union Army early in the morning of July 2nd of 1863 instead of attempting to flank the extreme left in the afternoon? What would happen if Meade counter-attacked on July 4th 1863? These questions and more can be answered within the game engine of Ultimate General: Gettysburg. The battle is dynamically fought in time phases and can last up to 4 days. Each day can be separated by up to 3 time phases and the armies' condition and positioning on the map are saved. According to battle events, you have the possibility to take decisions that can change the tide of the battle based on your prior tactical prowess. For example, when leading the Confederates, on the morning of July 2nd, you can choose to attack at Cemetery Hill and not make a delayed flanking maneuver at Peach Orchard... if you have managed to take Seminary Ridge the previous day! You can even choose to defend and wait for your AI opponent to take the initiative between days. These choices greatly increase the number of possible battle outcomes and challenges. Utilizing satellite images and historical maps, every major location, house, ridge and hill are depicted as accurately as possible within the game's unique art style. If you are an American Civil War enthusiast, you will be especially happy to notice the amount of precision and information that the map provides. Not only will you be able to better understand the historical layout of the map, you will also be able to make use of each location and landmark in battle, thanks to the simulation of cover, concealment, terrain and high ground in the game. All brigades have troop numbers and differing competencies based on historical facts. Additionally, all artillery battery numbers and types are correctly simulated. Lastly, major generals and officers actively participate in the battlefield to organize and support the armies and will also appear in after action battle reports to help you monitor battle progress. Drag simple movement arrows to command large forces easily. Units do not need your micromanagement because they are able to act on their own initiative and re-align, switch targets, withdraw and form battle lines without player input. Consequently, you are able to give generic commands to your units and can rely on them to fight efficiently without the need for "babysitting". Elevation and obstructions will affect unit visibility realistically. Units may make use of concealment and cover to survive artillery barrages, stage ambushes and more, but beware - the AI will attempt to do the same to you. The units enter or exit the Fog of War gradually with a fade in/out effect that helps you perceive their hiding and course seamlessly. In Ultimate General: Gettysburg, you will realize that army units are not "machines" that blindly follow orders, but will need to conserve strength and courage for decisive battle actions. Every basic tactical element that is expected for a strategy game is incorporated into gameplay. Most importantly, morale is affected by many factors including flank or rear attacks, casualties, volley shocks, artillery fire and fatigue. Furthermore, every inch of the map has a strategic role. Sloping, terrain type and obstructions will affect unit movement realistically. Elevations, ridges and hills provide excellent firing positions and give increased sight, morale and accuracy to troops stationed there. 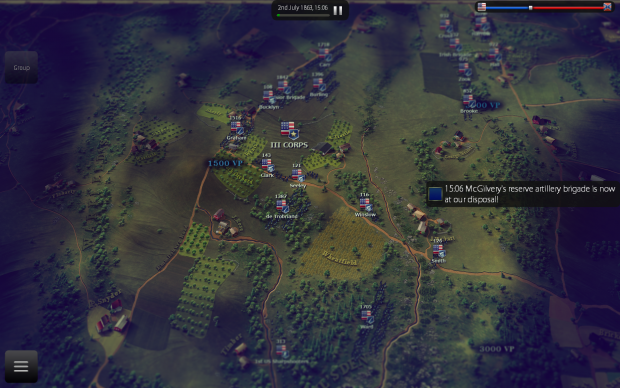 Different AI Commanders and the dynamic multi-day battle will provide countless ways to enjoy the Battle of Gettysburg every time you replay it. The replayability increases with additional custom battles. As you fight the Multi-Day Battle of Gettysburg, you can unlock dozens of speculative scenarios that you may play afterwards for quick battles, either randomized or with full unit strength and default army deployments. The game currently offers 5 maps for 1vs1 matches and is continuously improved according to user feedback. Plans for the future are to expand to a campaign multiplayer and support co-operative gameplay between multiple armies. Ultimate General: Gettysburg is developed by Game Labs and designed by Nick Thomadis, known for his successful and popular "DarthMod" series. With this first project, Game Labs wishes to give birth to a new strategy brand that will gradually evolve and expand into different eras. Ultimate General: Gettysburg is finally... released! After about 4 months in Early-Access, the game is now officially released. It has been a long journey and collaborating with all of you has been one of its most exciting steps. The Steam Early-Access program has been very beneficial to the project. Your reports defined what would make a great game. Your many positive reviews motivated us to respond with passion and dedication. Syncing with your requests assisted us in reaching our goal and bringing the game to release. We are not only talking about bug fixes and necessary balances, but also new features that we added following your criticism and feedback. We wish we could add more, but development could not take longer and we believe that we’ve built a complete and innovative game. Nevertheless, we will continue to support Ultimate General: Gettysburg and we hope that you will enjoy it for a long time. The project starting taking shape around a year and a half ago. We announced it last July by explaining our main goals for the game features. In our developer blog, we frequently provided information for our progress. On 12/2/2014, Ultimate General: Gettysburg attempted to get Greenlit on Steam and after 8 days, it succeeded. Before we enter the Early-Access phase, we needed to fix major inconsistencies, instabilities and bugs. For this reason, we invited more volunteer testers to assist us by play testing. The big time came on 12th June 2014 when we finally released the Early-Access version. You can read the full version history at this link. Ultimate General: Gettysburg is the first released game title of Game-Labs. We tried to introduce many new and innovative features such as the unique movement gestures and the realistic line of sight and emphasized on tactics and AI. The battle of Gettysburg is one of the biggest and most important battles of American history. This is why we approached the design with extra care to historical accuracy and paid attention even to minor details that would mean a lot to everyone who is interested in American Civil War. Soon it will be also available in MacOS store and other platforms. We are going to continue to support Ultimate General: Gettysburg and in the meantime, will focus our efforts on the mobile releases, firstly for iPad. In parallel, we will work for future battles, possibly based on a different era as well. Thanks to your amazing support, the Ultimate General brand has successfully entered the strategy gaming world and is going to offer you more titles. Follow our progress and you will not be disappointed. Meanwhile we would appreciate if you review our game on metacritic and steam review section. Our next update leads Ultimate General: Gettysburg closer to final release. 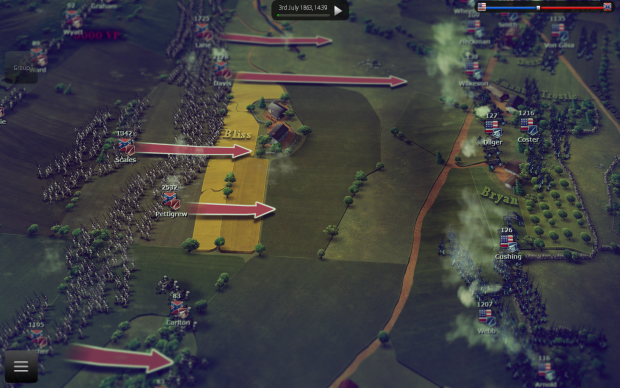 Ultimate General: Gettysburg available in Steam Early Access! You asked for it. Here it is! 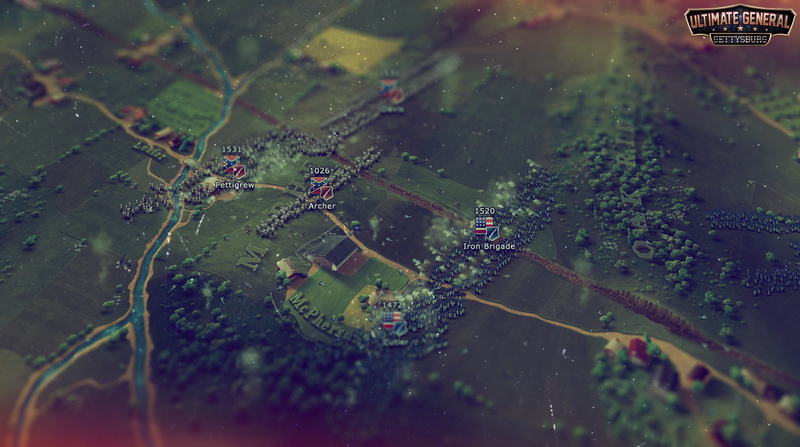 Watch the first gameplay footage of Ultimate General: Gettysburg! Ultimate General: Gettysburg, has been Greenlit! Thanks to your amazing support, Ultimate General: Gettysburg has been greenlit by Steam after 8 days of voting procedure! It would be great to select the initial order of battle, that is start the campaigne with the South in a order that you select, Stewart calvary in front, with Longstreet, then artillery, then supplies, then Pickett....you select the marching order of divisions or corps to give a different spin to the encounter. For the North, maybe Buford isn't in the lead? Select the order of corp in the marching line up to start. What if Picketts men were at the front rather than Earlys men. for example. I think the fact that this game has such simple graphics will allow us to command armies of tens of thousands instead of cuple thousand at max like in total war. I also think this man deserves a prize for all those years when he made our total war games playable. I myself wont buy the game but im sure many others will. Would like to volunteer as a tester if you are looking. I have tested games for other developers and realize the importance of prompt feedback. Bit worried by who is making it, but hopefully it goes well. I find your lack of faith .... Disturbing. There was some controversy over the exact reasons for his depature from modding. Don't get me wrong, i love his work. He modified some values and flipped **** when he wasn't named a god. Why? Are you questioning the power of the dark side?